It was just a little wave of the hand. During our last week of summer break, my kids and I trekked out to Colonial Williamsburg for a day. We explored the market, took pictures of the horses pulling the carriages through town, and watched the weaver at work. So, he’d grip onto one sister’s palm. Then another. Trading back and forth. Then I held his hand for a bit in one of the shops because–golly, there are a lot of fun things a three-year-old wants to touch and shouldn’t! Glancing down, I saw him giving a little wave to someone in the group of fellow visitors. But we didn’t know anyone in the crowd. So, a little confused, I followed my son’s gaze to see who he was connecting with. That’s when I saw a man in an electronic wheelchair just across from us return my son’s little wave with his own little nod of greeting. As we moved from place to place in the town that day, I think we must have seen that same man with his family at least three different times and my son waved each time to him. It was just the smallest thing. An acknowledgement. A little hello. I don’t know why my three-year-old noticed this gentleman in particular or what encouraged him to make any sort of connection. I didn’t see him wave at another person the whole day. But sometimes, I guess, you just know when someone needs a kind greeting, a friendly wave, and a smile . May we be noticers, too. May we pay attention to those around us. May we be sensitive to a hurt heart, a need, or a bad day. May we be “refreshers”–those who renew joy, renew strength, renew hope, and pour Jesus into the lives of others. For I have derived much joy and comfort from your love, my brother, because the hearts of the saints have been refreshed through you (verse 7). What was it about Philemon that blessed the hearts of the saints around him? Life can tangle us up in complications and busyness. Our own needs scream for attention and our own hurts can entice us to draw inwards instead of reaching out. We have so many reasons, so many reasonable reasons, to hold back. I’m an introvert. Hospitality and mercy are some of my greatest weaknesses. I have four kids and a crazy schedule. But Philemon wasn’t refreshing the hearts of others with an international ministry or a multi-step program. It wasn’t a full-time job or a massive undertaking. What he was doing wasn’t complex or time-consuming. It was so simple: Love Jesus. Love others. Share your faith. Make the phone call. Write the note. Bake the cookies. Set a time to get together. Listen well. Pray hard. Send a text. Oh the precious, priceless ministry of refreshment. And oh how desperately needed it is. All around us are weary brothers and sisters who are slogging it out in a spiritual war (Ephesians 6:12) on a battlefield of a futile world (Romans 8:20). None of us can be “refreshers” all the time. We need refreshing. We need others to bless and encourage us. To jump in with some help when we’re weary. And we don’t need to be afraid or ashamed to send out an SOS when we’re the ones who need refreshing. We all feel the weariness sometimes. We’ve carried that weight of discouragement before, or sorrow, or worry and fear. Paul knew that when he needed help he could ask for it. Refresh my heart in Christ (verse 29). We can’t always be refreshers—sometimes we need to be refreshed. And when we’re refreshed, we’ll grow stale unless we in turn refresh others. We give and we receive; we love and are loved; we refresh and are refreshed. My daughter and I settled onto the bus for our overnight trip to New York City. We each pulled out our books and book lights and enjoyed some reading time as we pulled away from the parking lot and headed out onto the road for our grand adventure. About an hour into the trip, I pulled out my blanket and little travel pillow and asked my daughter to do the same. We were, after all, supposed to be sleeping on this bus and we were certainly going to need that sleep since we were hitting the streets of New York City by 6 a.m.
Only, she hadn’t brought her pillow. She’d left it back at the house. So, I handed mine over (because I love her and I’m her mom) and tried to sleep without it. Now, I do not sleep in moving vehicles, and this night the odds were particularly against me. I was in a completely, wonderfully comfortable bus for daytime travel. Nevertheless, I was still mostly upright, with highway noise for my soundtrack, surrounded by 50 people, and without a pillow. We shuffled this way and that through the night. None of us on the bus slept more than an hour or two , and even that was in fits and starts. At 3:40 that morning, the bus lights flicked on to full strength and we pulled into the New Jersey rest stop where we were scheduled to start the day. Everyone filed out to use the bathrooms, change our clothes, brush our teeth, and buy coffee (or tea!) from the 24-hour Starbucks. From then on, it was go, go, go. Drive around the city. Eat breakfast at the diner. Walk through Central Park. Stroll through the Museum of Art. Subway back to our bus for lunch and the ride to the hotel. Quick showers and changes. Back onto the bus for the ride to the Lincoln Center for a ballet performance. Finally, we settled back at the hotel around midnight after being awake for about 35 hours of the last 36 hours. A bed never felt so good. The pillows were luxury and the sheets were heaven. Normally, I hate sleeping away from home and restlessly fidget all night long. Not that night. I slept the deep sleep of the truly exhausted. for the Lord has dealt bountifully with you (Psalm 116:7 ESV). Right there when I was pushed to the max physically, I needed to know that rest doesn’t entirely depend on circumstances. Some seasons are stressful and full of huge crises or petty daily annoyances. Life demands so much of us–sleepless nights while we rock the baby, or work the job, or care for the loved one, or nurse the sick, or more. Our hearts can be tumbled into pits of anxiety with one phone call, one nasty email, one ridiculous Facebook post, one bank statement or unexpected bill. Maybe we’re running at full-speed because of blessing and not burden. We’re packing for the big move or working hard on the big project. Our rest isn’t in peaceful circumstances or ideal conditions; our rest is in Jesus. He doesn’t just bring us peace; He is our Peace. Like the dove that Noah sent out from the ark, we can seek rest in so many places in the big wide world but never find it. The dove searched throughout the earth for a dry place to set down and only found water, water, and more water. The bird only found rest when it returned to Noah. The same is true for us, as well. Noah’s dove found no rest outside the ark, so she returned to it. In a similar way, my soul has learned today, more fully than ever, that there is no satisfaction to be found in earthly things–only God can give rest to my spirit…they cannot fulfill the desires of my immortal spirit” (Morning and Evening, January 29th). We may search and search, looking for rest and finding only stormy seas. Ultimately, we truly find rest by returning not just to the ark, but to our Master. We return to Jesus. Like the dove, we can’t face the night on our own, flapping our wings in the darkness until we’re exhausted. On our own strength, we’ll drown. When night looms, when we’re deeply tired, when we realize that nothing else satisfies, we stop trying so hard on our own and release control into His hands. That is the rest our weary souls need—trusting Jesus because He is so trustworthy. You gave them bread from heaven for their hunger and brought water for them out of the rock for their thirst, and you told them to go in to possess the land that you had sworn to give them. as in a dry and weary land where there is no water. it flowed through the desert like a river. their soul fainted within them. and he delivered them from their distress. like the shade of a great rock in a weary land. and the tongue of the mute sing for joy. I the God of Israel will not forsake them. and fountains in the midst of the valleys. and the dry land springs of water. he split the rock and the water gushed out. broken cisterns that can hold no water. On that day living waters shall flow out from Jerusalem, half of them tothe eastern sea and half of them to the western sea. It shall continue in summer as in winter. 9 And the Lord will be king over all the earth. On that day the Lord will beone and his name one. Jesus said to them, “I am the bread of life; whoever comes to me shall not hunger, and whoever believes in me shall never thirst. Whoever believes in me, as[a] the Scripture has said, ‘Out of his heart will flow rivers of living water.’” 39 Now this he said about the Spirit, whom those who believed in him were to receive, for as yet the Spirit had not been given, because Jesus was not yet glorified. The Spirit and the Bride say, “Come.” And let the one who hears say, “Come.” And let the one who is thirsty come; let the one who desires take the water of life without price. you refreshed your weary inheritance. For they refreshed my spirit and yours also. Such men deserve recognition. By all this we are encouraged.In addition to our own encouragement, we were especially delighted to see how happy Titus was, because his spirit has been refreshed by all of you. May the Lord show mercy to the household of Onesiphorus, because he often refreshed me and was not ashamed of my chains. Your love has given me great joy and encouragement, because you, brother, have refreshed the hearts of the Lord’s people. I do wish, brother, that I may have some benefit from you in the Lord; refresh my heart in Christ. I pick up the cups of water I poured just two hours before and dump them into my plants. At least foliage appreciates lukewarm refreshment. Or, perhaps I’m feeling particularly savvy that day, and I pop in an ice cube before handing these daughters the same cups of water. Either way, my youngest girl guzzles it down and lets out a satisfied “ahhhh” in gratitude. It’s fresh water she wants. Cold. Newly poured. Even if the water she has isn’t stagnant or stench-ridden, hot or unhealthy, it sat just a little too long in that Tinkerbell cup and now she needs new. Normally, as a mom I protest a little. Two hours is not enough time to de-freshen water, I tell her. It’s not ice-cold, but it isn’t ‘soggy,’ or undrinkable. But my soul takes this in because surely she’s discovered what I’m longing for. My Christian walk isn’t stagnant or rancid, but still I long for ‘new’ and ‘more.’ I don’t to walk out of 2015 the same way that I walked in. Each year, I choose this One Word and a Scripture to meditate on all year long to focus my heart, mind, and life. The first year, I chose “Breathe” (Psalm 62:2 MSG). Then last year, I spent 12 months meditating on “Presence” (Exodus 33:14 NIV). These were spiritually life-changing for me, not just a random New Year’s task that seems so important on January 1st but loses all meaning by January 31st and not just a cute catchphrase that is temporarily inspiring but ultimately meaningless. Already, I relax into the grace of this. So often, New Year’s is a time of heaping burdens on our backs. Resolutions. Reading plans. Prayer plans. Devotional plans. Health plans. Schedule plans. Clutter plans. Relational plans. Educational and job plans. This is what we want to do, do, do this year. Piled on top of that are the bricks we haul around of recrimination, regret and self-condemnation because of all the plans that failed last year and the year before that. There are the projects we didn’t finish and the resolutions we let fall by the wayside. There are the 15 pounds we were supposed to lose. There is the study we started and never completed. So, we carry “Failure” from one year onto the next and chain the new year before it’s even begun. What if we started Fresh? What if we let the past go and we eased into the new year with devotion and relationship with God instead of any agenda or program? What if we take this in? he refreshes my soul (Psalm 23:2-3 NIV). He does the work. He leads; we follow. He offers us the cool water to drink and we guzzle it down and let it drench our parched soul. The beauty in this promise is that as we pour out encouragement, blessing and generous helpings of grace to others, He will refresh us. Proverbs 11:25 tells us that God looks after the generous. 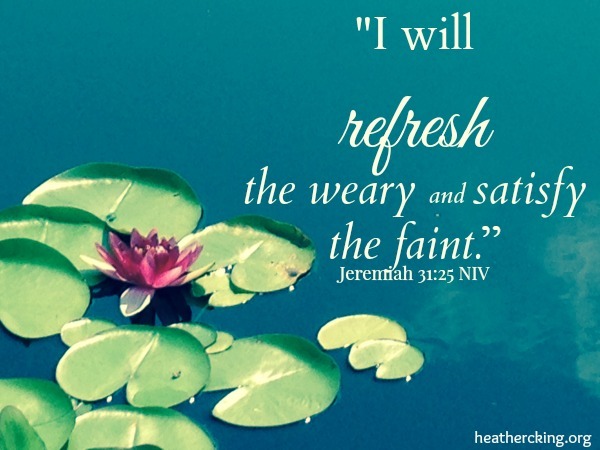 He refreshes those who refresh others. Not with leftovers or scraps or day-old water, either, but with the deeply satisfying draft of the Living Water only He can give. I can try to fill up from the tap of the world or the tap of self-accomplishment or the tap of taking care of me, me, me. But it will be ‘soggy’ and old, tepid and bitter. It’s Jesus I need. And not the Spiritual experiences I had ten years ago or five years ago or yesterday. I need Jesus—Fresh—-now—-newly poured into my life day after solid day. Refresh me with His Word: (Psalm 19:7). Refresh me with rest in His presence: (Psalm 23:2-3). Refresh me through service: (Proverbs 11:25). Refresh me through a pure heart (Acts 3:19). Refresh me with His people (1 Corinthians 16:18). It’s strength we need for the weary days and revival we need for the dead and broken within. It’s a filling up so Christ is splashing over the tops of our lives so that we can pour out to others with generosity and grace. It’s rest in His presence rather than perpetual motion, and it’s new, cold, Living Water we need from it’s only true Source. 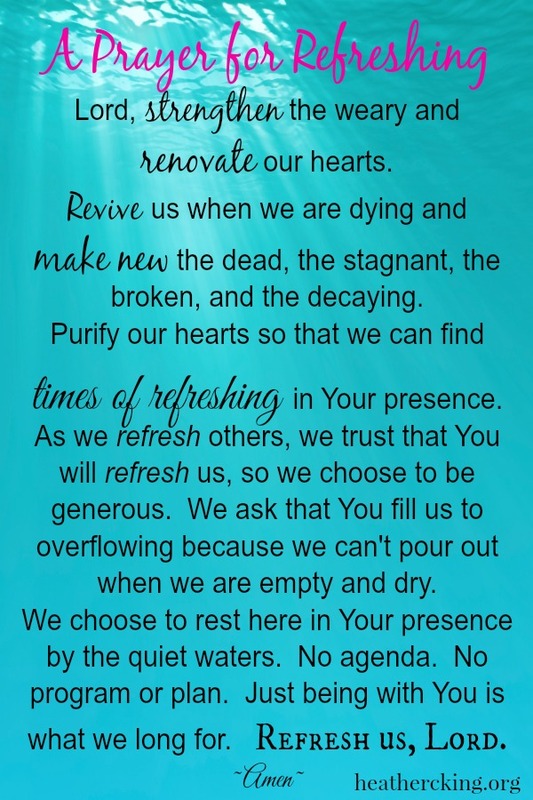 Refresh us, Lord, we pray.